OrganizerLogic's baskets for storage are the perfect organizing baskets for your home. The large canvas storage bins are made in the U.S. from woven cloth that is lightweight and sturdy. A plastic waterproof liner keeps your belongings clean and dry. The baskets have tall sides with reinforced leather handles for additional stability when storing or carrying. The organizing baskets are portable and are an excellent solution for organizing your shelf, living room, bedrooms, bathrooms, closets, playroom, nursery, and basement. Use the containers as storage bins to declutter your kitchen, patio, toilet, and living room. 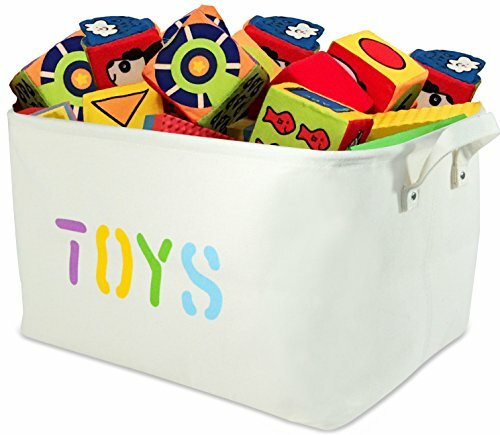 Best as a storage basket for kids, toy storage, and dog toy box. Excellent basket storage organizer for toys, stuffed animals, and shoes. Replace those overflowing toy chests with stylish canvas baskets. Suitable storage baskets for men, girls, boys, kids, and baby. OrganizerLogic is a family-owned and operated company, and we pride ourselves on our customer service. We have an excellentSatisfaction Guaranteed. Please let us know if you have any questions or issues and we'll be happy to help! STAY ORGANIZED: Large 22"L x 15"W x 13"H cloth canvas storage basket helps organize kids toys, dog toys, linen, blankets, and the nursery. Excellent storage for children. REDUCE CLUTTER: Attractive fabric storage bins keep your items organized and out-of-sight. Best for laundry, blankets, shoes, crafts, and books. Great shelf baskets. EASY TO CARRY: Lightweight canvas storage bins with reinforced handles allow you to carry your load easier. Wire-rimmed edges add form and stability. Wipes clean. KEEP CLEAN: Waterproof plastic liner keeps dirt out and inner items clean and dry. Excellent for organizing the kitchen, living room, bathroom, closets, playroom, and car. EASY ACCESS: Get rid of your cardboard boxes and enjoy a decorative storage basket instead. Open top keeps items accessible and makes it fun and easy for kids to help pick up! If you have any questions about this product by OrganizerLogic, contact us by completing and submitting the form below. If you are looking for a specif part number, please include it with your message.